Blending traditional Chinoiserie detail with classic Hollywood Regency design, this elegant white nightstand brings a touch of old world glamor to the modern home. Chow feet and an carved floating table top give an exotic, flair to the piece. A white lacquered finish and silver drawer pull combine in a simple, sleek color palette. 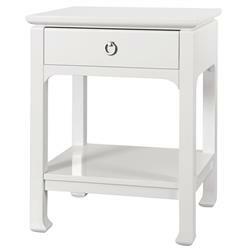 Alongside the bed or as an accent table, this pretty little number adds style and function.